*Note: Starting with the Legacy version 4.8+, on to Photocrati Pro (v5.0.2 +), any new preset that you activate for the first time will automatically use the Modern (responsive) skin. If you have updated your theme to the Legacy version 4.8 or above, you will remain in Legacy (not-responsive) mode after the update is complete, and must activate the Modern (responsive) skin. This will essentially open your existing theme with a new stylesheet, optimized for both desktop and mobile viewing. To enable the Modern (responsive) skin, first make a save of your current customizations, by going to Theme Options > Choose Theme > Save Current Customization. Its good practice to make a save each time you do any significant changes to your theme's style. 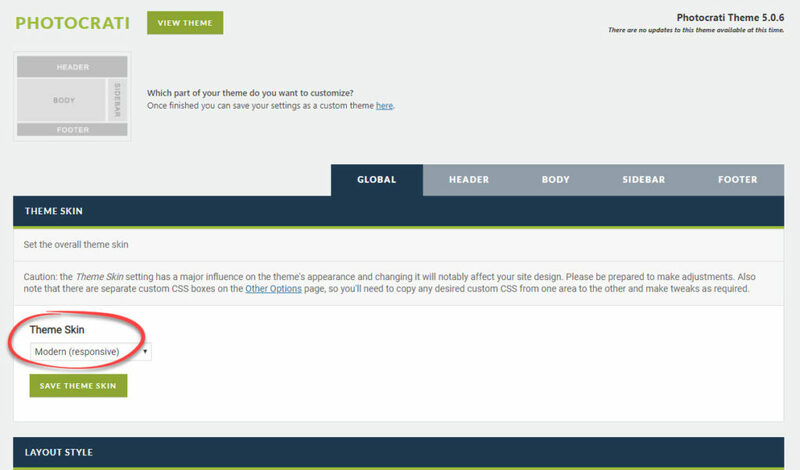 Once you've saved your settings, proceed to Theme Options > Customize Theme > Global > Theme Skin. Here you will switch from Legacy (not-responsive) to Modern (responsive).